Kakamega County today witnessed the passing out of the newest entrants into the public service at the community level – Community Adminstrators – in a colourful ceremony presided over by H.E. Governor Wycliffe Ambetsa Oparanya at Bukhungu stadium, Kakamega. Governor Oparanya who was accompanied by other leaders including his deputy H.E. Prof. Philip Museve Kutima, said the adminstrators were recruited through a lengthy and competitive process devoid of political interference. 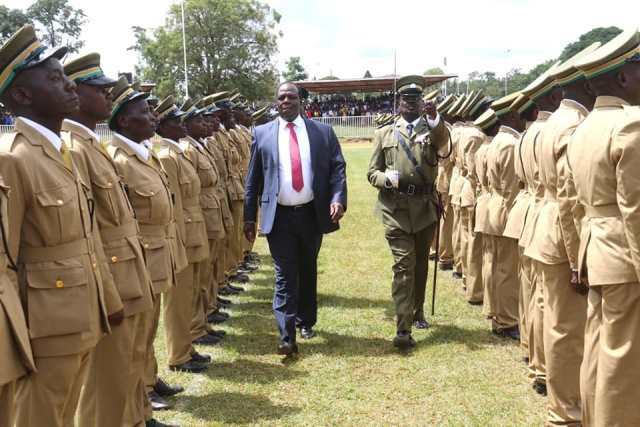 He called on the recruits to diligently serve their employer – the County Government of Kakamega – in accordance with the supreme law of the land – the Kenyan Constitution. “I urge you to be good ambassadors of my administration and internalize the important operational documents in place such as the 2017-2022 manifesto, County Government Act 2012, County Intergrared Development Plan 2018-22 and the Annual Development Plan,” he said. The occasion also saw H.E. the Governor issue licences to boda boda operators who have been trained by the county government on road safety as well as commissioning of 360 improved house structures for vulnerable groups in the society in addition to issuance of a mattress and other essential personal effects to them by the Governor. ▪ Chair and coordinate community policing initiatives. In attendance were the Speaker of the County Assembly, Hon. Morris Buluma, his deputy Hon. Kasaya, the leader of Majority, hon. Joel Ongoro, CEC members, Chief Officers, Members of the County Assembly, Advisors in the office of the Governor, Directors and other senior government officers among other leaders.